Brexit does not yet seem to be hindering the export of fruit and vegetables. Last year, this trade increased slightly by 0,8 per cent. In 2018 the total export value of fruit and vegetables was EUR1,397 million. The year before this amount was EUR1,386 million. In 2016, it was EUR1,369 million. Flower and plant exports showed a moderate slowdown in the last year. In total, exportation of these products decreased by 2,4 per cent. It dropped from EUR1,086 million to EUR1,060 million. This decline is more substantial than the average. In 2018, the total value of export products decreased by EUR170 million. This figure is for products from Dutch companies to the United Kingdom. The amount came to EUR20,2 billion. This total is one per cent less than the previous year. 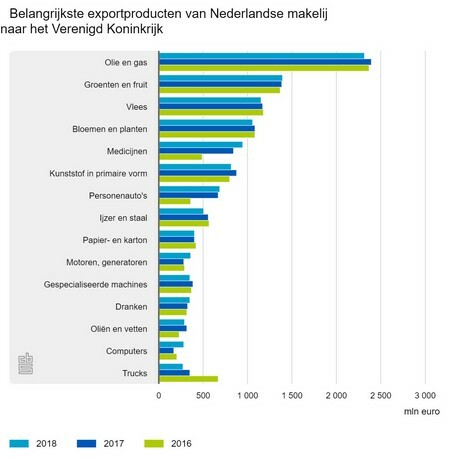 The most important export products from Dutch companies to the UK. Click here for the figures.